In this post I wanted to share some tips that made my development process more efficient and precise. There are many tips about saving time and effort in Storyline. Most likely, you've already heard about the benefits of the format painter and slide masters. Therefore, I tried focusing on things that were rarely mentioned or not obvious to me at the start. We all know that naming layers and objects on the timeline is a good idea so that you know which one of the 10 "Rectangles" is your custom-made "Submit" button. Sometimes though, giving your objects numbers instead of names may be more efficient. For example, let's say you are working on an e-learning filled with complex terminology like "agranulocytosis" or "propylthiouracil" or some other Lovecraftian-sounding language. And let's say you need to provide additional explanation for three of these complicated concepts. 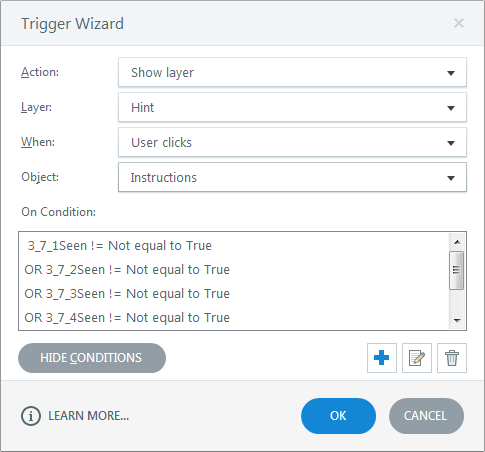 You create three buttons for the learner to click to see the matching layers with additional content. Or maybe you create a drag and drop interaction where you need to match the complex terminology with its description. 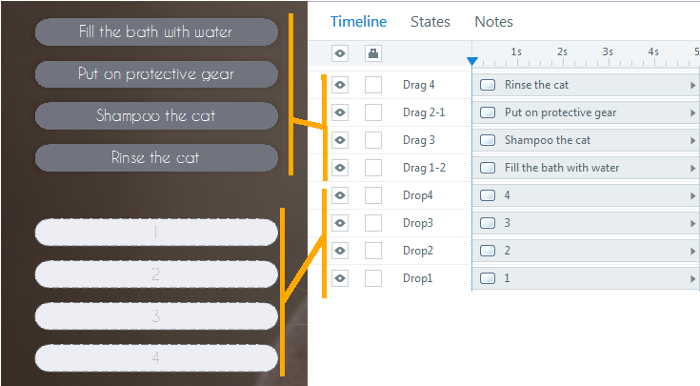 It may be easier to match "Drag 1" to "Drop 1", rather than trying to remember if "Shampoo" is "Step 3" or "Step 4". In this case, instead of using the actual terminology from the course, I use numbers. This helps me to save time not only on typing or copy/pasting, but also reading and comprehending what is what. I find it much easier to match "Layer 1" to "Button 1", than "Layer Triiodothyronine" to a similar clickable object. Lastly, it is gives a much cleaner Trigger list for double-checking if everything matches. Ahhh. A treat for a Sheldon Cooper within you. Same can be true for variables. I prefer to give them numbers, with a one-word description, if necessary. For example: 3_33_L1Seen. This tells me that this variable tracks whether or not the user has seen Layer 1 on slide 3.33. The reason I number my variables by scenes and slides, is that if I need to come back to the project after a break or an interruption, I can easily remember, which variables are related to the slide I'm working on (since I can always see the number of slide, but I may not always exactly remember what was the variable name: was it L1Seen or Seen1L?). Since I know that there are 6 clickable objects on the slide, I can quickly check if they are all accounted for by looking at the numbers. Using slide numbers in variables helps you find them in the list, if you're using a lot of them. In addition, it makes the "sanity check" quicker. When I need to double-check if everything is accounted for, I don't need to read the names of the variables and correlate them in my mind with the named objects. I compare numbers with numbers instead. Faster and less straining on my cognitive resources. Let's say you need to change 3 things on 5 slides (and you can't do this with master layouts). What I've noticed many tend to do (and what I did myself before) is to go slide by slide and make all adjustments on each. While this may give you the satisfaction of having each slide done before moving onto next, I find this strategy inefficient. Think about it - you have to keep in mind at least three things. You also need to make sure you do not forget to do any of them even if someone distracts you. Then you actually need to do them, which also requires your attention and cognitive resources. It is actually hard, particularly if you're working in a busy open office. When I "conveyor-belt" my tasks, I can focus only on one task at a time and don't need to mentally switch between them. This way I am more likely to get into the "flow", which gives me a faster pace. So, I go through all the slides, make one change, tick it off the list. Then go through the slides again, making another change and tick that one off, too. It sounds like it would take more effort, but I found this much easier purely from the cognitive load perspective. This can be said about pretty much anything: buttons, exercises, typical slides, quizzes - anything that you may want to reuse. I used create all of the elements on the slide. For example, if I had a menu with 4 buttons, I would make all four of them and then test how they all work. These days I create one button and 3 placeholders. Then I make sure that I like it and it is working as intended (because if it doesn't, I'm about to create a lot more work for myself). Then I either copy/paste the finished object or use "Format Painter" on the placeholders. It's not immediately obvious, but you can also copy/paste layers with their triggers, including into other slides. When my placeholders are on the same slide, copy/pasting will preserve the formatting and triggers, but not the position. But let's say my placeholders were perfectly arranged and now I want the copies of the actual objects to appear exactly in the same place. Let's also assume that my finished object also has triggers, which I want to keep, so using a Format Painter is not that efficient. In this case, instead of copying and then manually dragging the elements across the slide, I use the Size and Position dialogue. To open it, select any object and press Shift+Ctrl+Enter. I note the coordinates of the placeholders and then enter the same numbers for the position of the copies. I can then delete the placeholders by selecting them on the timeline. No more eyeballing, mouse-wrangling or nudging. Quick and easy. This option is not obvious at all and it took me a while to notice it. 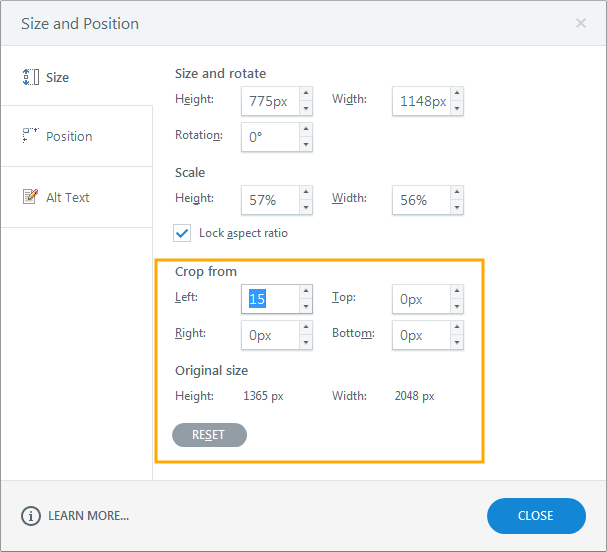 If you need to crop an image to a pixel (and you want to use Storyline, rather than an external tool), don't waste time and patience on the Crop button. 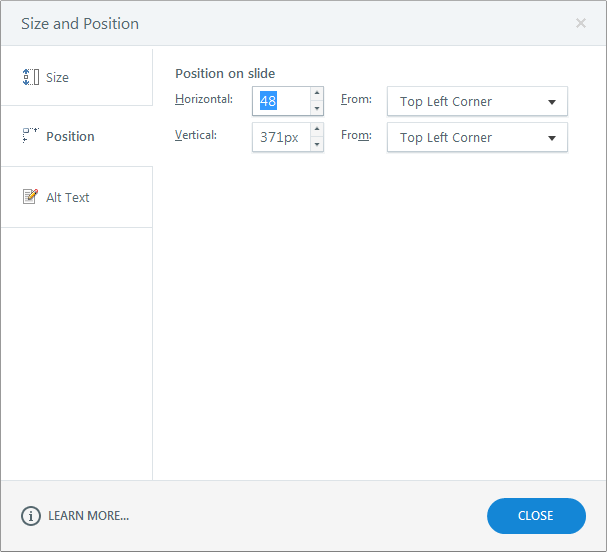 Instead, select an image, press Shift+Ctrl+Enter to open Size and Position dialogue again, and enter the crop values there, under Size tab. Pixel-perfect crop with the synchronous preview. Badum-tshh! Word of warning - does not work well with flipped/mirrored images, so crop them before you flip them. Want to make sure that all of the text boxes you create from this point onward have 8% transparent background fill, #3333333 color text and 30 point margins on all sides? Create one element and format it as you wish. Then right-click it and select "Set as default…" in the menu. From now on all text boxes that you create will inherit these settings. The "default" settings are separate for shapes, text boxes and buttons. Let's say you made a square shape, added all sorts of fancy stuff to it, but now you need it to have rounded corners. Instead of deleting the old object and recreating everything from scratch, you can simply use Change Shape option in Storyline, which works exactly as the same function in PowerPoint. The only thing you may need to adjust is the shape size. 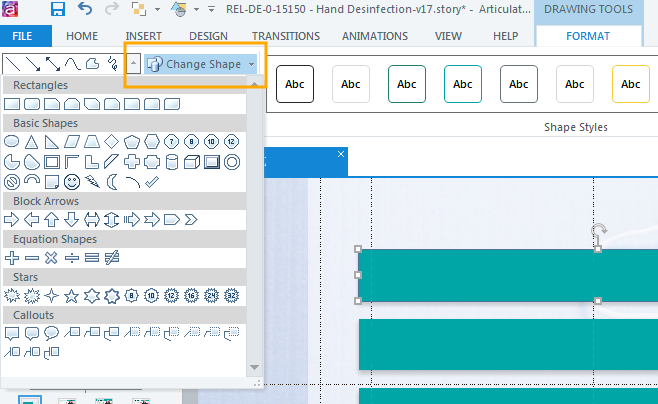 Select a shape, click Format in the Drawing Tools and choose Change Shape. Note that this may not always work well with objects that have multiple states. For example, if you change a square button into a rounded square and adjust the size of the corners, the corner sizes will not be inherited by all states. Change wisely. Liked some ideas? Hated some ideas? Found a typo? Let me know in the comments or reach out to me through my fancy (hey, there is "fancy" in "infancy"!) new site.